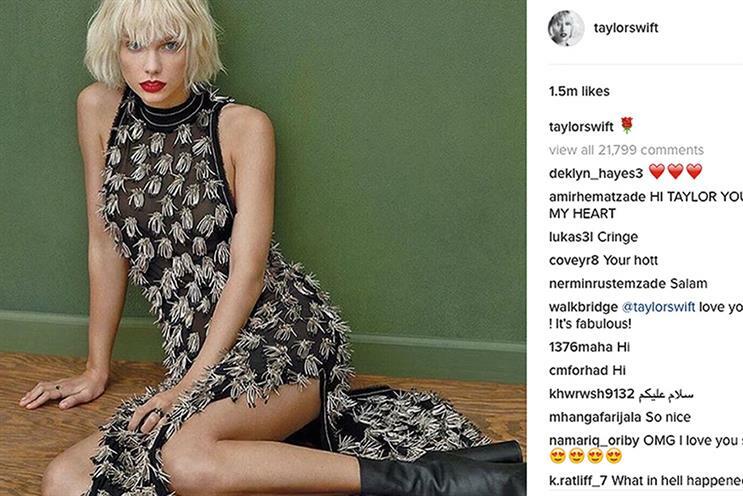 When negative comments posted beneath Taylor Swift's Instagram pictures recently disappeared en masse, reports suggested the musician had been given a "secret" tool to delete online abuse. Campaign understands that Instagram is testing ways to manage abuse and spam, and it is trialling these methods on accounts with a high volume of comments – namely celebrities. Instagram wouldn’t comment on whether it is testing anti-abuse tools with Swift, or whether this would give her the ability to remove all negative comments at will. But a spokeswoman said: "We’re always looking for ways to help people have a positive experience with comments on Instagram. "We're currently focused on providing tools to improve accounts with the most high-volume comment threads, and we will use our learnings to continue to improve the comment experience on Instagram." UK brands may soon be privy to similar controls, should Instagram roll out the new tools more widely. The overall experience for UK brands on Instagram is set to improve. Separately in May, Instagram rolled out business profiles in the US, New Zealand and Australia, giving companies recognisably branded accounts, analytics and promotion tools. Profiles will roll out globally by the end of the year. Brands can look forward to better automated comment moderation, according to Tom Ollerton, innovation director at We Are Social. "The obvious conclusion to this is where artificial intelligence fits in," he says. "There will be AI being developed which can understand what abusive content is, and which can deploy an interface or chatbot that debates with a user whether something is potentially offensive to other people." But winning the battle against online trolls won’t be easy, Digby Lewis, head of platforms and distribution at Iris, notes. Social media is becoming more visual, so how do algorithms moderate against, say, the person who sent Leslie Jones, the black star of Ghostbusters, a picture of an ape? Lewis points to Snapchat’s built-in facial recognition: "You need that kind of complex technology to understand Facebook Live or Periscope, and to understand that moderation may not just be required for words and audio but visual as well." Then there’s the fine balance between censoring users and keeping celebrities who drive huge amounts of user engagement happy. It would be "dangerous" if social platforms were to lose high-profile users, as they help attract brands, Ollerton says. But it’s unlikely that celebrities will desert social media in droves for their own "safe spaces", as actor David Hasselhoff did in 2008. "I don’t think there’s going to be another Hoff Space," Ollerton adds. Like celebrities, advertisers also deal with high levels of abuse from online commentators. More automated tools will make the lives of in-house community managers easier. If celebrities have more capabilities to deal with online abuse, they are more likely to stick around on social platforms. That’s a win for services such as Instagram, as well as the marketers who want to target highly engaged millennial audiences. Comment moderation reduces the risk of advertisers damaging their brands by accidental association with offensive content.